Thanks to Flavor Flav, Vegas’ showgirls are about to fill out their g-strings a little more generously. The rapper turned restaurateur has opened a fried chicken take-out restaurant near the strip! 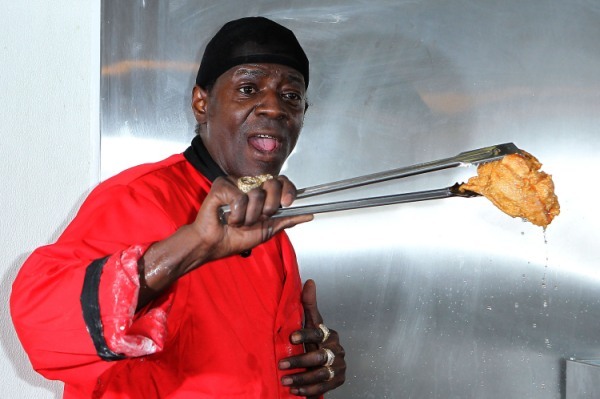 It’s take two for Flavor Flav’s fried chicken. The time-conscious rapper is placing bets that Las Vegas’ party people are ready for a little soul food. Flavor Flav‘s House of Flavor opened Thursday with the Public Enemy rapper performing the ribbon cutting ceremony. The restaurant, located a few blocks southeast of downtown Las Vegas, is the 53-year-old’s second foray into the fried chicken market. 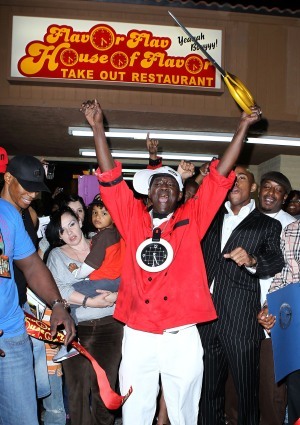 An announcement regarding Flavor Flav’s House of Flavor notes the new restaurant is not associated with the former eatery, despite the continued use of the star’s own homemade fried chicken recipe. Other items on the Flavor Flav’s House of Flavor menu include collard greens, macaroni and cheese, mashed potatoes, biscuits and what sounds like a new food invention: Red velvet waffles. Are you game to give Flavor Flav’s House of Flavor a try?